Woodfield Hunt Club is a prestigious gated community located in central Boca Raton, FL with over 300 custom-built estate homes that are situated on large, beautifully landscaped home sites. This upscale, family-friendly neighborhood offers two 24-hour manned gated entrances, providing residents the utmost privacy and security. Residents of Woodfield Hunt Club have the unique option of joining Woodfield Country Club with the purchase of an equity membership as well as the annual club dues. With development beginning in the early 1980's, Woodfield Hunt Club has continued to expand with the addition of many newly constructed custom-built homes. The community now offers over 320 luxurious, single-family estate homes that feature a variety of unique architectural styles. Ranging from "Old-Florida" inspired designs to more modern Mediterranean influences, there is sure to be something to suit unique tastes and styles of all homebuyers. Woodfield Hunt Club homes are situated on large, private lots that range from 1/4-acre to over 3/4-acres in size. These spacious homes typically offer 3,200 to just over 7,000 square feet of living space with a plethora of exquisite home features and designer finishes. Features commonly found in Woodfield Hunt Club homes for sale include gourmet kitchens with granite countertops, custom cabinetry, and high-end appliances, upgraded tile and wood flooring, vaulted ceilings with crown molding throughout, large master suites, and luxurious spa-like bathrooms. Many homes in Woodfield Hunt Club also boast private swimming pools with incredible golf course, lake, and garden views. Woodfield Hunt Club has recently undergone significant renovations to many of its resort-style amenities and community facilities. The community now offers a brand new clubhouse featuring a new fully-equipped fitness center, a luxurious seating area with a large television, and a spacious party room perfecting for group gatherings and entertaining. Woodfield also features five Har-Tru tennis courts with a full-time on-site professional tennis staff, community basketball courts, two beautiful parks, and children's playgrounds. 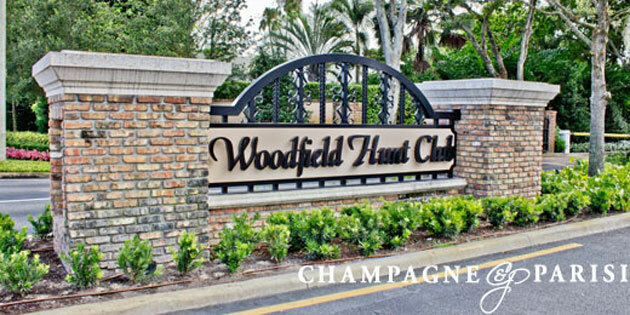 Woodfield Hunt Club is conveniently located in central Boca Raton just west of Jog Road on Yamato Road. The community is close to Mizner Park, Boca Town Center mall, and some of the areas best dining, shopping, entertainment, and museums. I-95 and Florida's Turnpike are close by providing easy access to West Palm Beach and Ft. Lauderdale. Woodfield Hunt Club is also zoned for some of Boca Raton's A-rated public schools, including Calusa Elementary School, Omni Middle School, and Spanish River Community High School. There are many highly-acclaimed private schools within close proximity to the community as well. If you would like to learn more about Woodfield Hunt Club or any of the other gated communities in Boca Raton, please contact us at 561-998-9015. You may also reach us by completing the brief online contact form provided below and one of our Boca Raton residential real estate experts will be in touch to assist you and to answer any questions you may have. We at Champagne & Parisi Real Estate are committed to providing the highest level of professional real estate services and unparalleled customer service, and would be delighted to have the opportunity to assist you in finding your next dream home in Boca Raton, FL!